BuzzFeed reaches millions of people every day through its fun, engaging and informative content—and every year, thousands of people apply to become a part of the company. BuzzFeed is working with Uncubed to identify candidates with the highest aptitude for each role and proactively invite them to apply—building a strong talent bench to fuel growth. As a growing business and a leading global brand, BuzzFeed’s job opportunities can attract hundreds of applicants a day. How can it identify and make offers to the people best suited for each role? 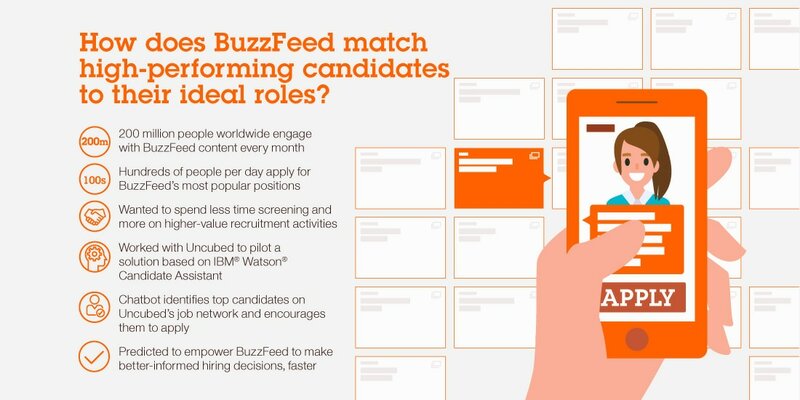 BuzzFeed teamed up with Uncubed to pilot an artificial intelligence driven solution based on IBM® Watson® Candidate Assistant—enabling it to pinpoint top candidates and encourage them to apply. Every month, 200 million people around the world engage with BuzzFeed content—and the company offers much more than viral videos, lists and quizzes. “At its core, BuzzFeed is about driving human connection,” begins Dan Geiger, Recruiting Ops Manager and Lead Recruiter at BuzzFeed. “Whether it’s a funny video or a Tasty video, our goal is to create, curate and deliver content that engages our audience and make them want to share it with their friends and family. With application volumes increasing year on year, BuzzFeed saw an opportunity to boost the efficiency of its recruitment processes. “Some of our most sought-after roles attract hundreds of applications per day for several days after we post them—and with such large talent pipelines, pinpointing the top performers is often a tough challenge for our hiring managers,” Geiger continues. To achieve its goals, BuzzFeed is working with its strategic partner Uncubed to pilot an innovative solution based on IBM Watson Candidate Assistant. Powered by artificial intelligence (AI) and cognitive technologies, the solution engages candidates in personalized career discussions and recommends positions that fit them best. Working together with BuzzFeed and IBM, Uncubed trained IBM Watson Candidate Assistant to interact with questions from its community. Today, prospective applicants can type questions about working at BuzzFeed into the chatbot, and receive real-time answers in the form of text, videos and links to open positions on the Uncubed site. With an AI-driven solution surfacing the right jobs to the best candidates, BuzzFeed’s recruiting team believes that the Uncubed solution will empower its talent managers to make better-informed hiring decisions, faster—a crucial capability as its business grows. "Uncubed integrates seamlessly with our own applicant tracking system, which means we can deliver the same straightforward, consistent experience whether people apply via Uncubed or BuzzFeed.com,” says Geiger. “The crucial differentiator with the Uncubed route is the ability to surface information that helps prospective applicants decide whether one of our roles is the right fit for their skills and experience. BuzzFeed is already beginning to measure positive results from its partnership with Uncubed. Today, 87 percent of BuzzFeed applicants coming in through IBM Watson Candidate Assistant, powered by data from Uncubed, progress from phone screenings to face-to-face interviews, compared to only 53 percent of applicants from other sources. In other words, BuzzFeed is 64 percent more likely to invite IBM Watson Candidate Assistant candidates in for face-to-face interviews than other candidates. By analyzing conversation data from IBM Watson Candidate Assistant, Uncubed continues to uncover insights to help BuzzFeed refine its recruitment strategy. BuzzFeed has already hired candidates via its partnership with Uncubed, and is currently interviewing more as the pilot continues. BuzzFeed is the world’s leading tech-powered media company, with a cross-platform news and entertainment network that reaches hundreds of millions of people globally. The company produces articles, lists, quizzes, videos, original series, and brands including Tasty, the world’s largest social food network. The company is also home to BuzzFeed News, a global news organization focused on original reporting and investigative journalism; and BuzzFeed Commerce, which develops social commerce products and experiences, as well as licensing and other strategic partnerships. Signup for the IBM Watson Candidate Assistant Trial today!